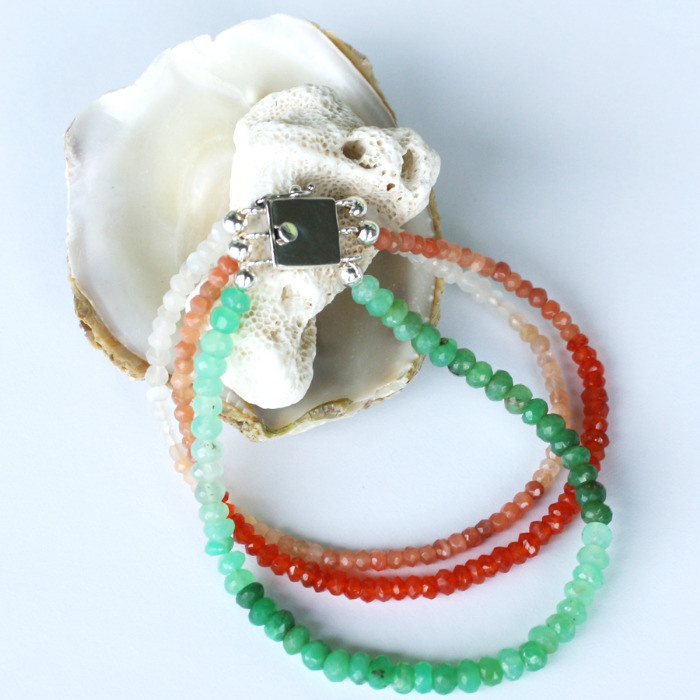 Chrysoprase, Carnelian, Peach Moonstone and Moonstone all merge together to make this one of a kind bracelet designed to bring about fertility. Moonstone has a feminine lunar nature that gives rhythm, cycles and destiny. Chrysoprase balances yin yang energy and evokes acceptance of self and others. Carnelian is bold and bright in color, offering power, strength and the energy of the mother goddess; it has strong fertility properties. Peach moonstone carries the intuitive, healing feminine properties of moonstone and gives protection during the childbirth process. All of these stones unite in a stunning piece of jewelry, but they also have the energy to create a powerful mother to be. Jewelry can be stylish and healing at the same time.